We at Nightwatch Paranormal have an appreciation of the Sea and the power of water in all it’s forms. We have a series of tales of Ghost ships, and Lighthouses Hauntings. One famous ship is the SS Edmund Fitzgerald. Now she does not really fit into the ghost ship category. Her remains are found and visited, and her crew has been seen in remarkably good shape. However the Witch of November, the tragic loss of life and sinking of the largest ship plying the Ore trade on the largest freshwater lakes is a combination that we cannot resist. Add in the Gordan Lightfoot tribute song that many of us grew up listening too, and we were compelled to add her tale into our catalog. To make it even better, as I pen this tale, it is the 50th anniversary to the day, of her sinking. Let us start with the lake herself. 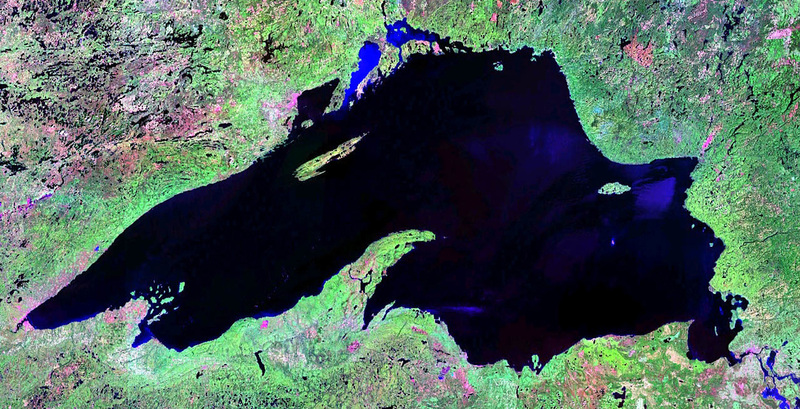 Lake Superior, known as Gitche Gumee by the local tribe, is the largest freshwater lake by surface area. This lake is large enough to drastically affect the surrounding climates. The Witch of November is supposed to be living in the lake, tales of which predate the coming of the white man to the region. She is said to never give up her dead. Interestingly enough, due to the make-up of the lake and it’s cold temperature, the bacterial action that usually causes the human body to become gas filled is completely stopped. This causes the bodies to sink instead of floating like they normally do. Upon a dive on the wreck in 1994, a body of one of the crew members was spotted face up in the mud, in remarkably good shape for being underwater for several decades. He was left in peace. No matter whether you believe it was the Witch or the weather, in the past 300 years 10,000 ships have perished on the lake with 30,000 crew going down with those doomed vessels. As to the ship herself, she was christened on the 8th of June, 1958. Her length of 729 feet, beam of 75 feet, and height of 39 feet made her the largest ‘Laker’ built. She was often a source of attention when passing through the locks at Sault Ste. Marie. She was built at the Great Lakes Engineering Works of Ecorse, Michigan. She was owned by Northwestern Mutual Insurance Company, which made them the first American insurance company to build its own ship. She was named after the head of the insurance company, Edmund. Her purpose in life was to haul taconite, which is a low grade iron ore, from mines on the shores of Minnesota to steel mills near Detroit and Toledo, Ohio. Being the “pride of the American side” she was known by several nicknames , including “The Queen of the Great Lakes,” “The Toledo Express,” and the unfortunate “Titanic of the Great Lakes. She was an impressive sight on the Great Lake. ​ Her date with destiny started like so many other late season runs. She was loaded with 26,116 tons of iron ore pellets on the 9th and left at 2:30 p.m. Gale warnings were in effect from the prior day, but that is a given this time of the year. Changing temperatures cause hurricane like storms to brew up out of nowhere ( or maybe it is the cauldron of the Witch of November). While she was sailing to her destiny the advisory was upgraded to an official storm warning. Swells reached 35 feet, and the wind gusted to over 100 miles per hour as the sun set with the Mighty Fitz running before the storm. We know the conditions, because as luck would have it a second ship, the Arthur M. Anderson, sailed 10-15 miles behind the Fitzgerald as a precaution, and the two ships remained in radio contact. The Fitz’s captain Ernest McSorly contacted the Coast Guard and her fellow traveler about 7:10 PM saying they were taking on water, but “holding their own”. Their position was about 15 miles north of Whitefish Point. This was the last communication from the ship. ​ On May 20, 1976, the Navy discovered her on the bottom in 535 feet of water. ​ Most of those crew were from nearby Minnesota with a smattering from Wisconsin, Michigan, and Ohio. In 1995 a team descended and retrieved the ships bell for members of the crew’s families. 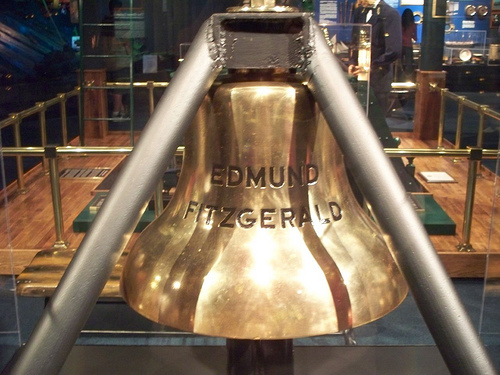 This bell is rung on the annual remembrance day at the Great Lakes Shipwreck Museum. It will be rung 30 times. Once for each crew member, with the 30th time for the other 30,000 souls still keeping the witch of November Company in the cold clear depths of Lake Superior. She hit 6 fathom shoal and started to take on massive amounts of water. The Coast Guard and NTSB theorized that the hatch covers were faulty and failed under the repeated wave strikes on the ship. However this theory was disproven by the expeditions to her resting place. She was hit by the three sisters (giant waves) and was swamped. This is a reported phenomenon where three larger than normal waves hit in quick succession often before the water from the prior waves has a chance to clear. This causes immense weight to be on the deck of a ship at the time. A wave engulfed the ship, pushing the front of the ship underwater. The ship then hit ground, and broke in two...this may be why the two portions of the ship are so close. Waves lifted both ends of the ship (bow and stern), but the center of the ship containing the cargo was not held by a wave, so the overload forced the center downward, sinking and/or breaking the ship in two. Or conversely a huge wave rode up between two swells and the ship snapped in half. The witch of November came stealing. We hope you have enjoyed our story on this doomed ship. There is so much more to this story than we have the time to relate, and we urge you to investigate and research on your own. If you come across anything we missed, let us know, we will add that to our future rewrites. Thank you for reading and keep on Watching the Night .